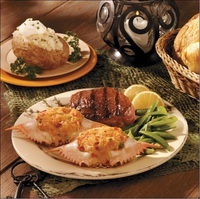 Coated in light Japanese Panko breadcrumbs, Mrs. Friday’s® Krabbycakes® are a delicious blend of real snow crab meat, fresh cream, real butter, seasonings and seafood. 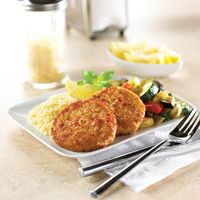 Savory and convenient, Krabbycakes® are ideal for value conscious operators and perfect for mass feedings. Great baked or fried. Keep frozen until ready to use. Do not refreeze. Convection Oven: preheat to 375°F. Place Krabbycakes on baking sheet and bake for 15-18 minutes. Note: due to differences in individual ovens, cooking times may vary, cook to internal temperature of 165°F. Deep Fryer: Heat oil to 350°F. Add Krabbycakes, shaking baskets occasionally to prevent from adhering. Fry for approx. 5 - 5 1/2 minutes.